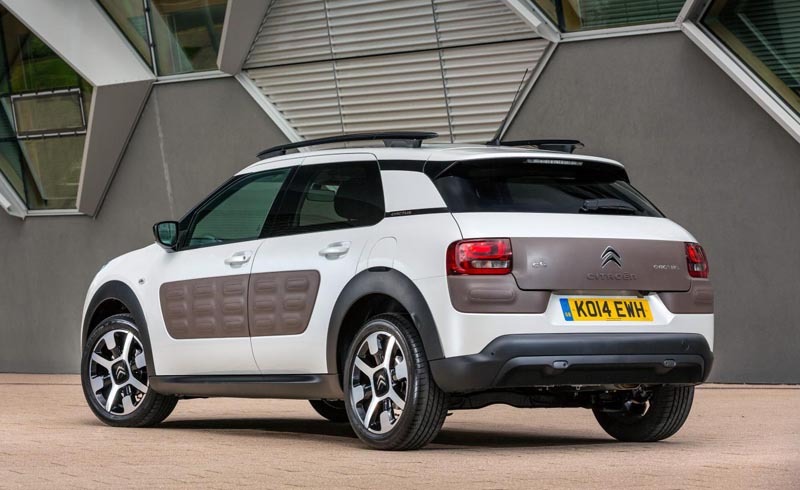 The new Citroen C4 Cactus is on sale now with prices ranging from £12,990 to £18,190. 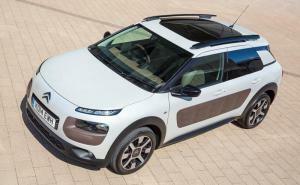 Based on the DS3 platform, the most striking element of the design is the protective panels on the doors. Dubbed Airbump, these air-filled capsules offer protection from minor dents and scrapes. They also form part of a wide range of customisation options for the car, and are available in a choice of four colours. Combined with the 10 exterior colours, six wheel designs, five upholstery choices and three trim colours, there should be a combination to suit everyone. The interior has been designed with simplicity as its focus, with an almost complete absence of buttons. Most of the car’s functions are integrated within a seven-inch colour touch-screen while a simple digital speedo is mounted in front of the driver. Some of the interior elements are styled to look like items of luggage, such as the luggage handle-style door pulls and the flip-top compartment on top of the dashboard. 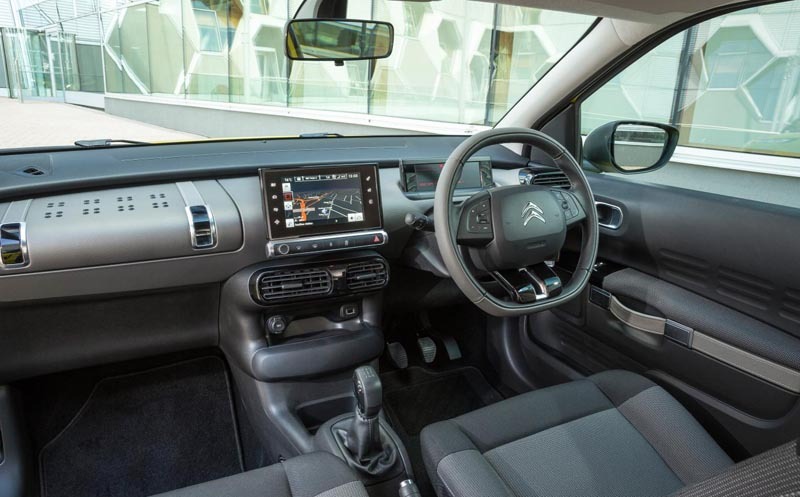 Five adults can be accommodated, a front bench seat is available on some models, and boot capacity is 358 litres rising to 1,170 with the rear seats folded. 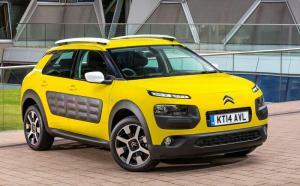 Three petrol engines are available, all 1.2-litre three-cylinder units, with power outputs ranging from 75 to 110hp. Diesel options arrive in the form of either an e-HDi 92 unit or a BlueHDi 100 engine, both of 1.6-litres. The latter is available only with a five-speed manual transmission, while the e-HDi unit is mated exclusively to Citroen’s ETG auto. 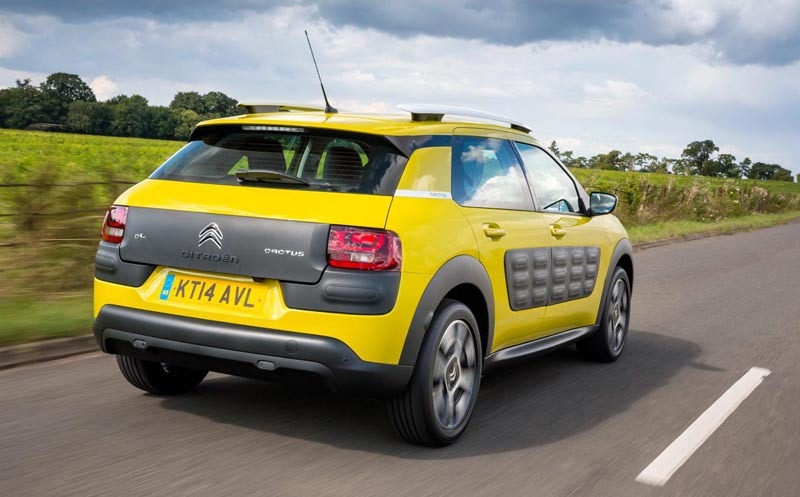 Efficiency and reduced cost of ownership is a key selling-point for the Cactus, with both diesel models recording sub-99g/km CO2 figures making them road tax exempt. The BlueHDi model is said to be able to achieve up to 91.1mpg on the combined cycle, with even the least economical model – the PureTech 110 – recording 60.1mpg. Some of this efficiency arises as the result of a focus on weight reduction, with the lightest model in the range weighing just 965kg. Key points include a special UV coating for the optional panoramic sunroof that negates the requirement for a sunblind, saving 6kg, while a new wiper system that integrates the washer jets uses less water, thereby allowing a smaller reservoir to be fitted saving even more weight. Three grades are available – Touch, Feel and Flair – with prices starting from £12,990.